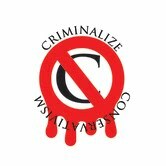 Criminalize Conservatism: Eliminate Conservative Gerrymandering - NOW! 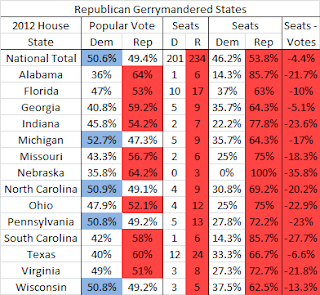 Eliminate Conservative Gerrymandering - NOW! "There are many Real Republicans starting to speak out against the intransigence and irrelevance of the Republican Party. Joe Scarborough has joined the likes of Colin Powell who gave a scathing rebuke of the party on Meet The Press,Col Lawrence Wilkerson who said his Party is full of racists, and Jon Huntsman who said the Republican Party is devoid of a soul. "Joe Scarborough said The GOP is getting smaller and smaller. He said that the GOP keeps pushing itself closer and closer to the cliff. He said that William Buckley rebranded Conservatism by going after Ayn Rand, the John Birch Society, and George Wallace. He illustrates how far Right the party has gone given that many of them now consider Ronald Reagan a RINO, a Republican in name only. "He continued by saying he made a mistake over the past month when he stated Republicans won a majority in the house. He acknowledged that it was the cheating of the gerrymandering process that allowed a Republican Majority since they actually got less votes than Democrats. "One would think that the message would be getting through, however Tea Party Wing of the Republican Party continues their continual attack on any Republican that breaks rank as they did when Colin Powell spoke out. They are even considering modifying how the electoral college allocates its votes to make it possible for them to win with a minority of votes. "Wikepedia offers a list of five ways to combat the situation when 'a given party is gaining disproportionate power' at http://en.wikipedia.org/wiki/Gerrymandering#Changes_to_achieve_competitive_elections. 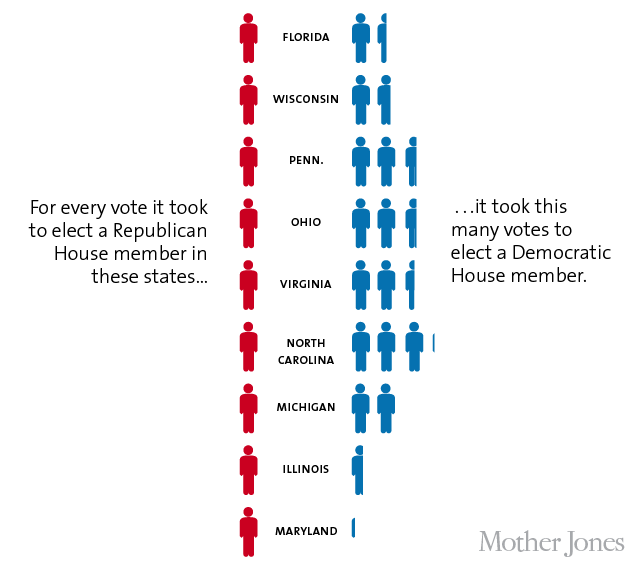 "Republicans maintained control of the House despite Democratic candidates receiving 1% more votes than Republicans. How could this possibly happen? 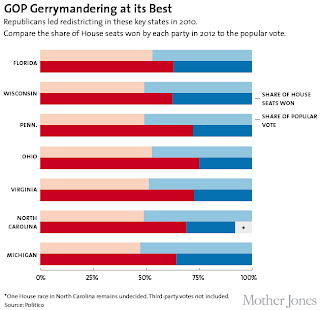 Well thanks to gerrymandering, Republicans have an unfair advantage in the House of Representatives and were able to hold onto power when the public voted them out. Repeat after me, this is no different than when George W. Bush won the electoral college while losing the popular vote...Tell all of your Democratic and left leaning friends and even your annoying libertarian relatives that through legalized theft known as gerrymandering Republicans stole the House of Representatives. 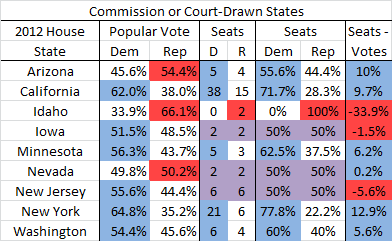 "In every state, Republicans won a higher seat share than their vote share (Georgia and a few others are deflated since some Republicans were uncontested). 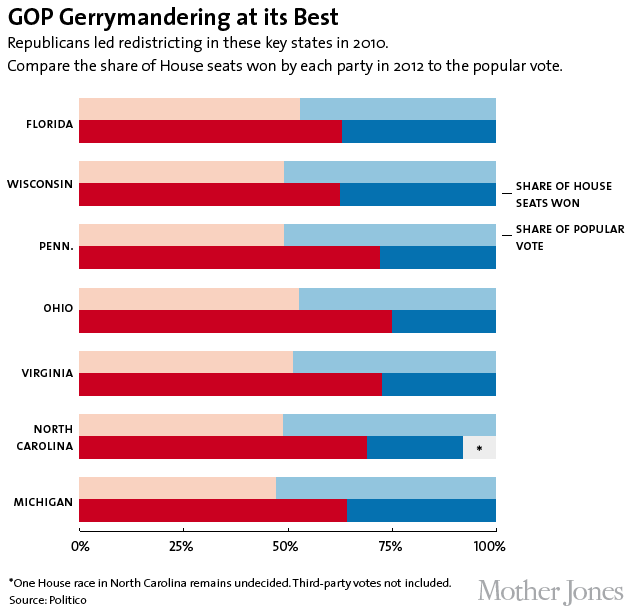 Though gerrymandering didn't contribute a great deal in states like Georgia where drawing single-member districts is what screws us, there are others like Michigan, North Carolina, Ohio, Pennsylvania, Texas where gerrymandering cost us multiple seats per state. "In contrast, Democrats had far fewer opportunities and weren't nearly as ruthless and in Arkansas even gerrymandered a map that gave Republicans all four seats! In both Illinois and Maryland we could have gained 1 more seat with more aggressive maps. "Looking at some states that had an independent or bipartisan commission or a court draw the map, on average the seat shares are much more representative of the partisan vote shares. "So what can we do, no what must we do, if we want to have a functioning democracy free of Republican hostage taking over the debt ceiling, harsh austerity, and institutionalized gridlock? Our immediate priority needs to be an organized effort to put non-partisan redistricting constitutional amendments on the ballot in states Republicans gerrymandered the crap out of. When the Supreme Court won't strike down partisan gerrymanders, establishing through ballot measure an independent citizens commission like that in California or that in Arizona is our best option over the near term. Longer term, we need to focus on winning the governor's office in states such as Ohio and Pennsylvania in 2018 to veto Republican maps. However, with the prospect of not being able to take the house until 2022 at the earliest under the current maps, redrawing the lines is the only way we have a shot at taking the house this decade. "Here's where you, me, the rest of the Daily Kos community, and Democrats in general come in. We need to get active in organizing these constitutional amendment initiatives in certain states, meaning fundraising, signature collection, and campaigning once these measures are on the ballot. 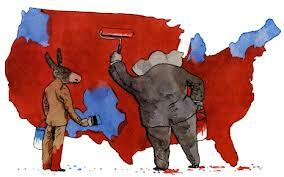 Independent redistricting, when the campaign is properly funded, polls very well and is a slam dunk at the ballot box. Passing these amendments now can give us several more seats in the House and help even out Republicans' unfair advantage. The bang for the buck is tremendous compared to the average congressional campaign and if you've ever donated money to a federal Democratic candidate, your return on investment will be even better here. "2: Fundraising - Daily Kos users have contributed millions of dollars over the years to various Democratic campaigns at all levels. If we can tap into just a fraction of that potential, the return will be much higher than donating to any particular congressional candidate. "3: Activism - This could be as simple as informing your fellow Democrats of the fact that we won the house popular vote and gerrymandering is the reason Republicans are still in power. This is no different than had Obama won the popular vote and lost the electoral college and every Dem should realize this. Additionally, those of us in Michigan, Ohio, or Florida can help gather signatures and do the nuts and bolts things that constitute modern campaigning once the measures are on the ballot. So whether you just want to spread the word or go out and volunteer, please do something! "All in all, these three states could send anywhere from 7 to 13 more Democrats to Congress and give us a vastly improved chance at breaking Republicans' hold over the state legislatures in all three states." Tomorrow we will look at the rest of the story, the "see what the maps currently and might look like for each state and the steps required to place these measures on the ballot." Until then, reflect upon the three steps we need to take: 1.) Organization, 2.) Fundraising, and 3.) Activism, the same steps needed to finally crush the vast criminal conspiracy known as "Conservatism," the largest criminal cartel in history.